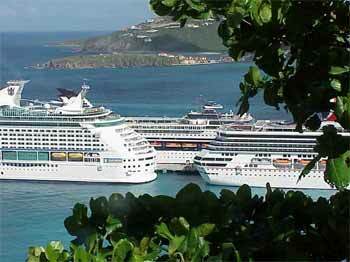 Search results for St. Kitts Island in Caribbean : Find Miami cruises and travel info. Above: Port of St. Kitts Island in the Caribbean. Intoxicating natural beauty, sunny skies, warm waters, and white sandy beaches combine to make St. Kitts one of the most seductive spots in the Caribbean. Christopher Columbus first spotted St. Kitts in 1493, when it was populated with native tribes, but the Europeans did not colonize until the British arrived in 1623. Location: St. Kitts is a Caribbean, islands in the Caribbean Sea, about one-third of the way from Puerto Rico to Trinidad and Tobago. Terrain: Volcanic with mountainous interiors. The highest point on the island is Mount Liamuiga at 3,792 feet (1,156 meters). Getting there from Miami: St. Kitts is located 1,266 miles (2,038 km) from Miami, FL. The easiest way to visit the Island is to fly. Travel Requirement: Beginning Jan 1, 2008, the Western Hemisphere Travel Initiative requires all U.S. citizens, citizens of the British Territory of Bermuda, and citizens of Canada and Mexico visiting St. Kitts to have a passport or other secure document that establishes the bearer’s nationality to enter or re-enter the United States. See a birds eye view of the region with our Google Caribbean Map. If you plan to rent a car in St. Kitts, be aware you will be driving on the left. The only islands in the Caribbean where you drive on the right are Aruba, Cuba, Dominican Republic, Guadeloupe, Haiti, Martinique, and the Netherlands Antilles. Taxi service is available on the island. Although metered rates vary, they are reasonable and are fixed by law. Bicycles and scooters are also available for rent at most popular tourist centers. You can use your home driver’s license but you'll need to purchase a temporary St. Kitts driver's license for $20. Remember, when you take to the road, British rules apply, so keep to the left. Pedestrians should remember to look right before crossing streets. Search Google for "St. Kitts Island" to find cruises to St. Kitts.